Sunday was a perfect sunny, winter day for outdoor activities. There wasn’t any wind and the temperature was in the fifties. 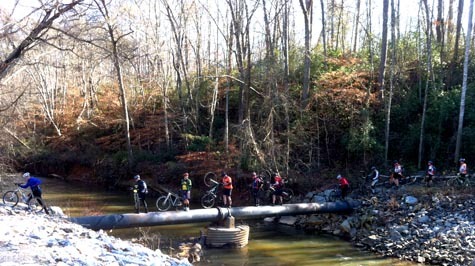 Hot on their trail was a pack of hounds that had to cross a treacherous pipe spanning a creek carrying their bikes. Amazing feat since bike cleats and slippery pipes are not a good combo. You might ask when do hounds carry bikes and wear cleats? Well they do if they are part of the Wheelhopper Hash House Harrier biking kennel. On our walk, we had the pleasure of our first encounter with a mountain bike hashing group. We had never heard of bike hashing before but a friendly hound explained they were on a mountain bike hashing adventure. We got a quick lesson in the lingo. Hares leave a trail of flour to mark their way. They include false trail markers to level the playing field for the less fit so more riders finish together. Laying out a good course requires preparation and creativity. The section of the hunt we saw was a challenging course through the woods, over the pipe to cross the creek, along the creek, up a steep hill on the road and through a church parking lot. What is a hunt without hound whistles? Whistles helped stragglers find their way. It was a friendly call to not lose any of their pack. For those of you fit enough, their group welcomes all with “half a mind” to join them. Doesn’t sound like a group that requires a lifelong membership to enjoy a Sunday adventure with them. The cost is $7 for the trail, ride, beer, soft drinks and munchies. According to their website, the BeerMeister is the most valuable volunteer. Hares are also important volunteers because they plan the course. You never know what you will discover when you venture out on your 10,000 step walks. 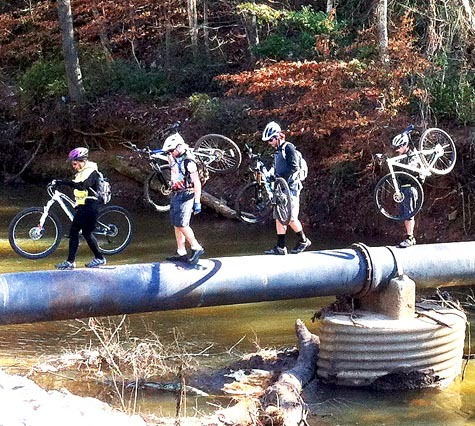 This social bike hashing group looked like they were having a wonderful time on a beautiful winter day. I feel so much happier now I unedrsatnd all this. Thanks! What is bike hashing? Wheelhopper Hash House Harrier biking kennel. Hares lead the way.